Bio: Patrick Cullen is a painter in oils, pastels and watercolours, known for his scenes of Tuscany, Andalucia and Southern France, in all seasons and weathers. Patrick studied at St. Martins School of Art 1972-73 before attending Camberwell School of Art from 1973-76. Over the past number of years he has made a number of trips to India, painting and sketching in the streets and markets of Rajasthan and Gujarat, and culminating in major solo exhibitions at Indar Pastricha Fine Arts, London in 2010 and 2013 and a five man exhibition at the Tryon Galleries, London in 2013 along with Ken Howard RA, and Peter Brown.He has received numerous awards and prizes for his paintings: most recently the Chelsea Art Society Painting Award in 2012. In this same year and again in 2013 and 2014 he was a finalist for the Lynn Painter Stainer Prize. He was elected to the New English Art Club (NEAC) in 1997. Navigation: Home page remains available on top of gallery pages. 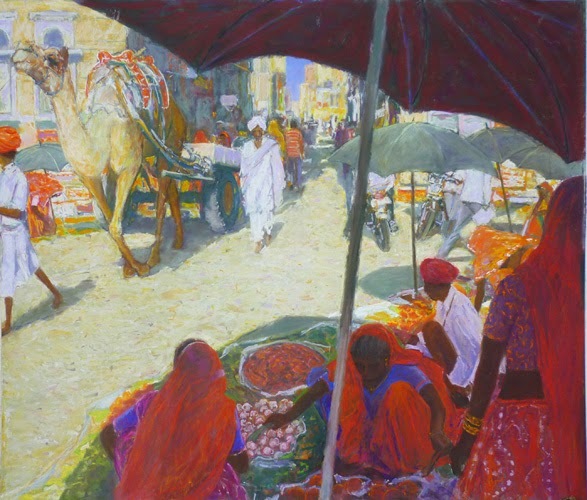 Gallery: Landscapes and street scenes; Paintings of India; Portraits, figures and interiors.